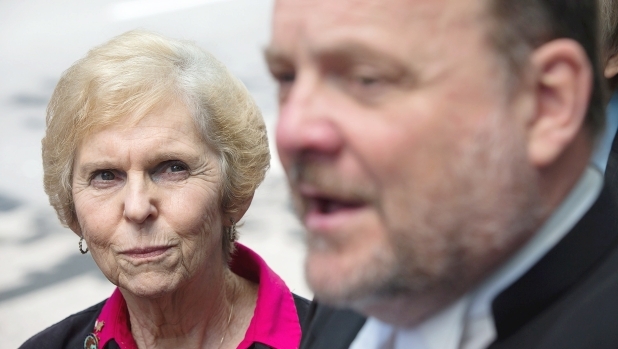 Jackie Scott, left, who was born out of wedlock in England in 1945 to an English mother and a Canadian soldier and is seeking a judicial review of her exclusion from citizenship based on the 1946 Canadian Citizenship Act, listens to her lawyer Jay Straith as he speaks to reporters outside Federal Court in Vancouver, B.C., on Monday, July 22, 2013. Canadian citizenship laws may need to be overhauled if a so-called “lost Canadian” wins her legal battle. Documents filed Friday in Federal Court in Vancouver show Scott is petitioning for “declarations” from the court that could have serious ramifications for Canadian citizenship, including whether Parliament has total control over who is considered Canadian. The government claims Scott’s father was legally a British subject rather than a Canadian at the time because Canada’s first citizenship act did not come into effect until 1947 and because her father and mother were not then maried, Scott cannot automatically be considered a Canadian. Scott and her lawyers argue that Canadian citizenship has existed outside of statutory law since long before 1947. They are willing to take the case all the way to the Supreme Court of Canada. In July, they debated pursuing a class action, but decided the application they filed last week was more appropriate. The application asks for Scott’s judicial review to be “converted to an action” that would allow the court to make declarations regarding six main questions, including whether Scott’s father was a Canadian citizen and whether citizenship exists as a legal concept and/or right independent of the 1947 Citizenship Act. “Enough of this nonsense. We want to set precedent,” said Don Chapman, the founder of the Lost Canadians. Chapman said too many people are being forced to pursue a lengthy court process because gaps in citizenship law have not been properly addressed by Parliament. “The entire area of citizenship is a disaster that has now evolved into a catastrophe,” said Straith, referring to statements made in May by the Chief Justice of the Federal Court. Although that case did not involve the status of Canadian citizenship pre-1947 or the passage of citizenship from parent to child, Straith said the comments “apply to the entire spectrum of problems in this area” and the government’s continued failure to address them. One reason Scott and her lawyers decided to switch the emphasis of her case was because the narrow nature of the judicial review prohibited them from introducing evidence related to broader citizenship issues. An example is a 1943 pamphlet issued to Canadian soldiers that deals “with the historic rights of Canadians as they were going overseas,” Straith said. It states that the soldiers “were fighting as citizens of Canada, not as merely British subjects,” he said, noting the presiding judge ruled it could not be considered. Scott and her lawyers said the pamphlet is just one of many documents that prove their case. One of the questions in their application is whether the Canadian government is forced to grant citizenship to people like Scott’s father because of previous Crown actions, such as issuing the pamphlet. “There is a concept in Canadian/Commonwealth law called the doctrine of the ‘Honour of the Crown,’ which primarily has been used in land claims cases where the Crown has basically tried to void earlier agreement made with First Nations,” said Straith. “Just as this government has been restrained by the courts from breaking the Crown’s legal word to First Nations, we believe that under this ‘Honour of the Crown’ principle the Harper government will again be restrained from breaking its word to veterans and their families,” he said. If they lose, Chapman said “we might as well go over to Europe and scratch the maple leaf off (the) gravestones” of Canada’s war dead. “It’s hard to put into the words the emotion that you feel when you can finally say that you’re part of the family, and also to be able to give the people that should have their citizenship confirmed just that,” she said. The government has until Aug. 30 to file a response. Scott’s new application will likely be heard in court in September.